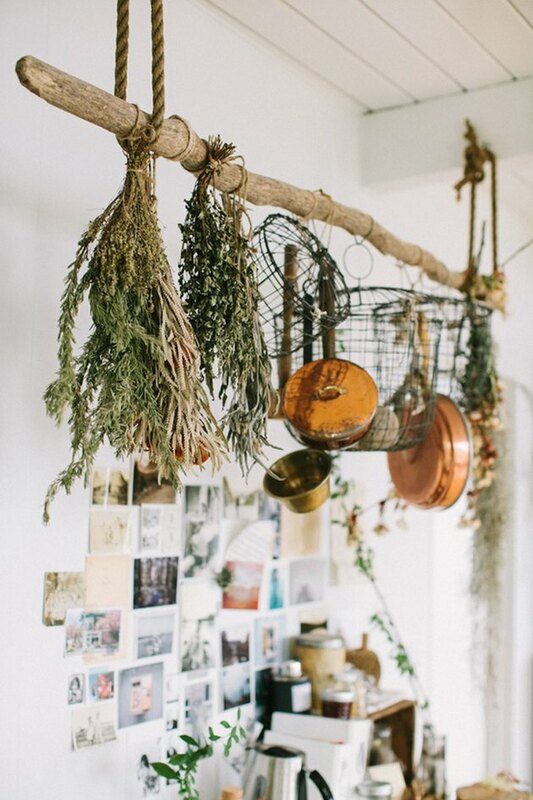 When you hear the word "bohemian," you might think of beaded curtains, macrame, palo santo, and plants on plants on plants. And what's not to love about that? So it's no surprise that in recent years, boho interiors have continued to surge in popularity from bedrooms to living rooms and even kitchens. 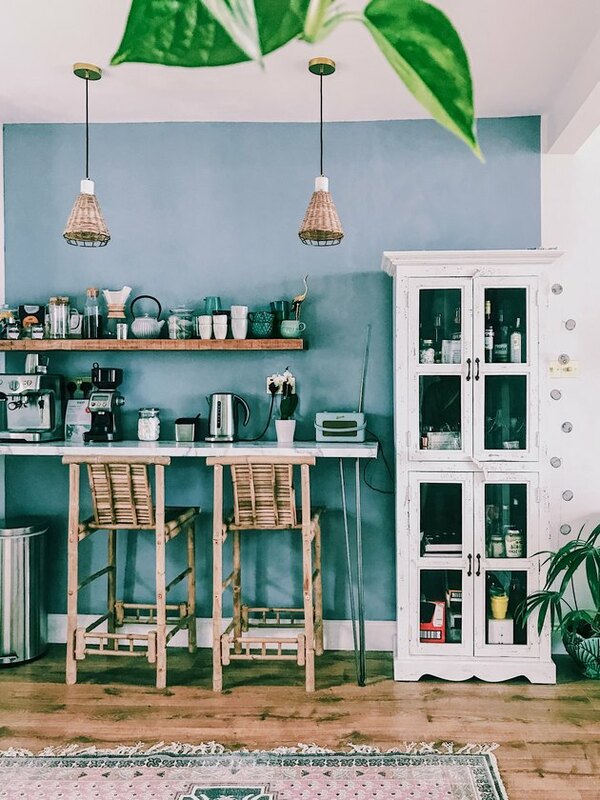 Mixed materials, a creative color palette, eclectic objects, and lush greenery are normally on the menu, but what does a bohemian kitchen really look like? Take note of these 12 culinary treats that have us reaching for our favorite kaftan. 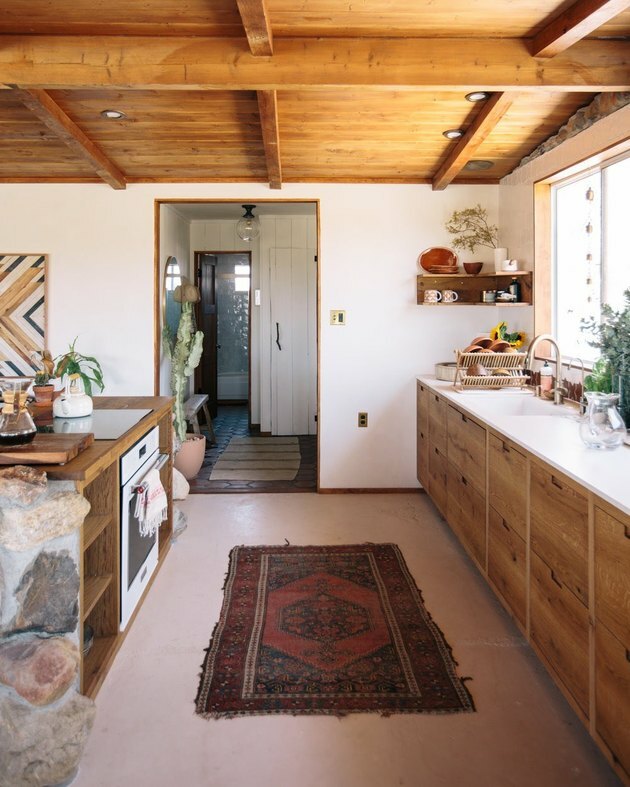 While not all of us are lucky enough to have a desert retreat in Joshua Tree, California, with an open view of the wilderness, complete silence, and starry skies, we can absolutely incorporate wood cabinetry, a wood plank ceiling, and stone detailing. Don't forget those strategically placed cacti for the ultimate bohemian paradise. 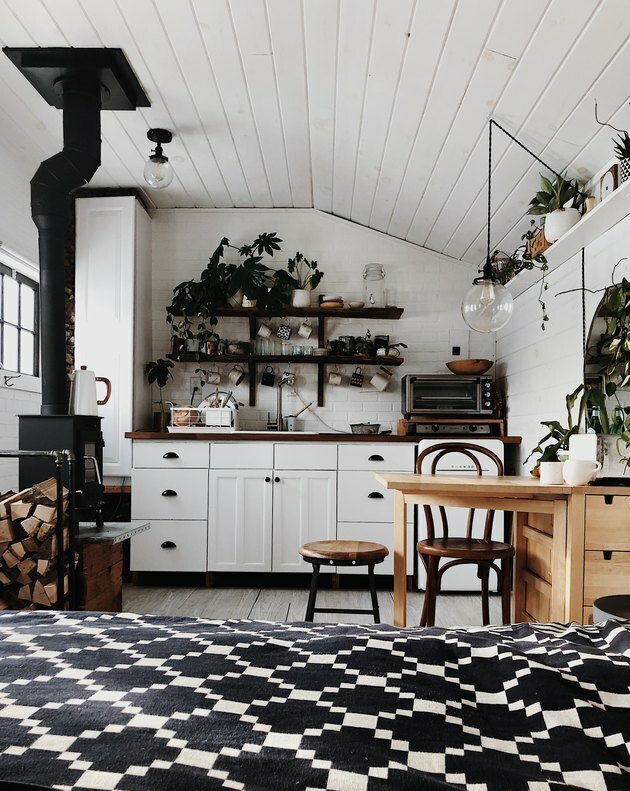 This perfectly rustic-boho kitchen belongs to creative duo Natasha and Brett from Tin Can Homestead and Sugarhouse Ceramic Co. We love the dramatic contrasting palette of black and white used throughout this small space. And when mixed with green foliage and industrial accents, like the wood burning stove, it's a match made in design heaven. Natural materials, abstract shapes, and neutral colors are central to the design of this kitchen by Allison Bloom. The communal breakfast bar is ideal for enjoying a nice matcha latte and a warm stack of pancakes first thing in the morning. Don't be afraid to add a pop of color. 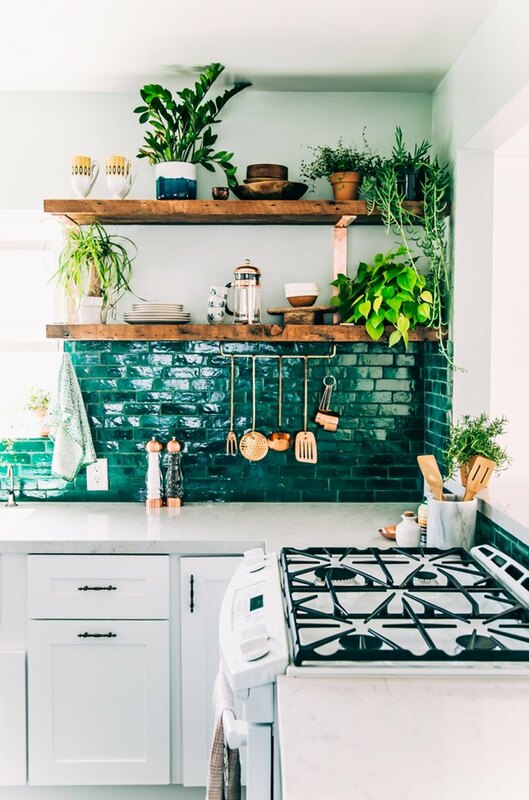 This vibrant bohemian kitchen belonging to designer Justina Blakeney from Jungalow showcases a dreamy emerald green backsplash to complement the lush greenery throughout. 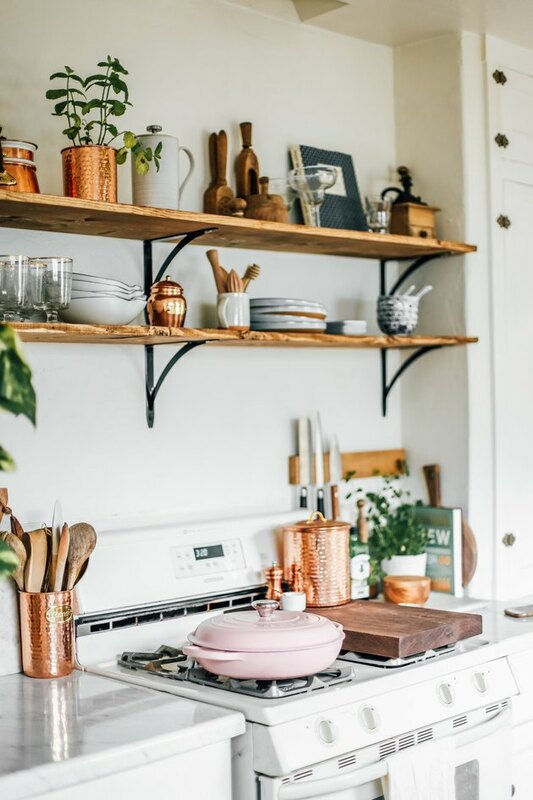 The floating wood shelves and the copper accents are the icing on this culinary masterpiece. 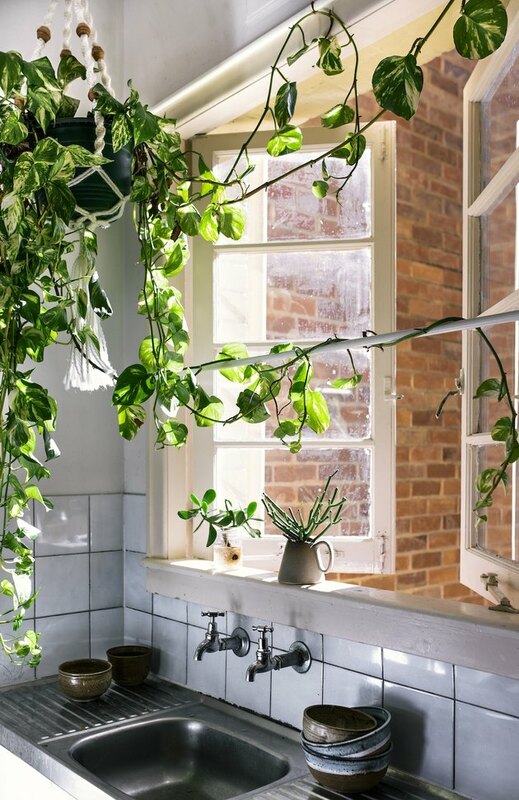 If you're looking to make some changes to your kitchen without having to partake in an entire renovation, follow the lead of photographer Nicolette Johnson and bring the outdoors in. With the help of hanging vines and tiny planters, a plain white space suddenly has a fresh new look. 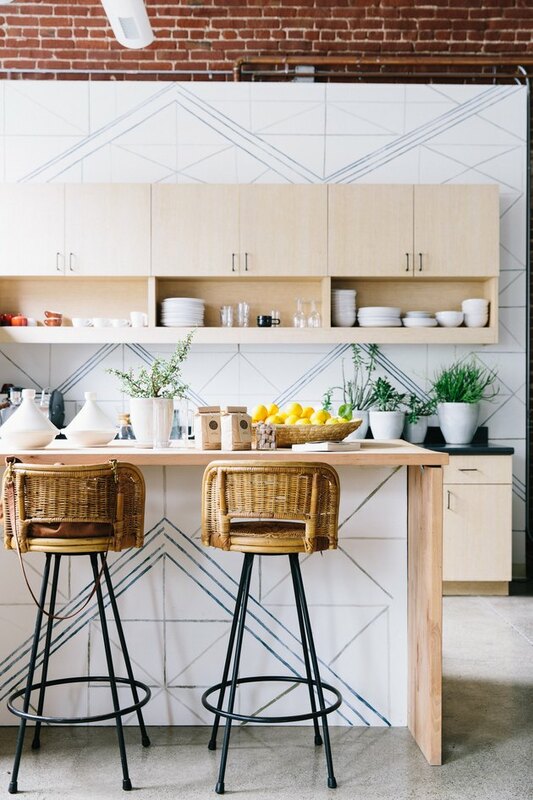 Make a statement in your bohemian kitchen, like this bright space captured by Woodnote Photography. The magic ingredients include a dash of out-of-the-box thinking, one wooden stick, a handful of rope, and voilà ... just like that, you have a DIY pot rack that's bursting with rustic charm. 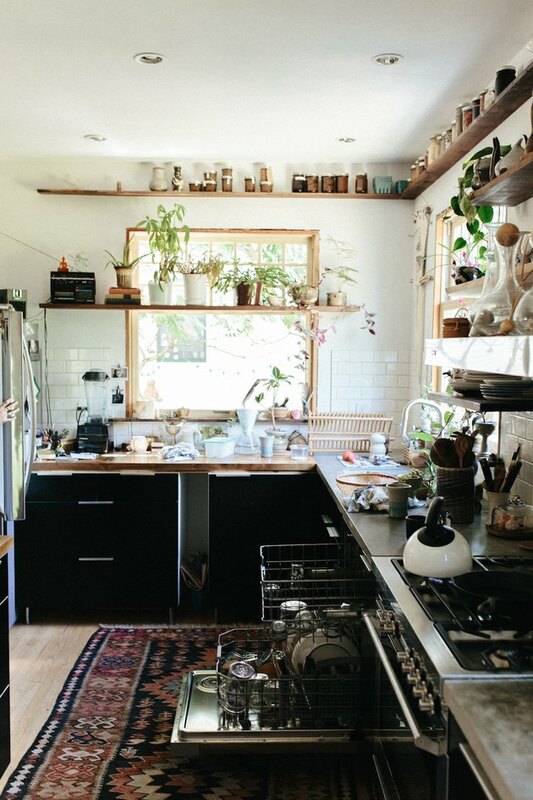 Elizabeth from the College Housewife knows a thing or two about decking out a bohemian kitchen. She used plants, wooden utensils and shelves, copper kitchenware, and handmade tableware to transform her drab rental and infuse her sparkling personality. 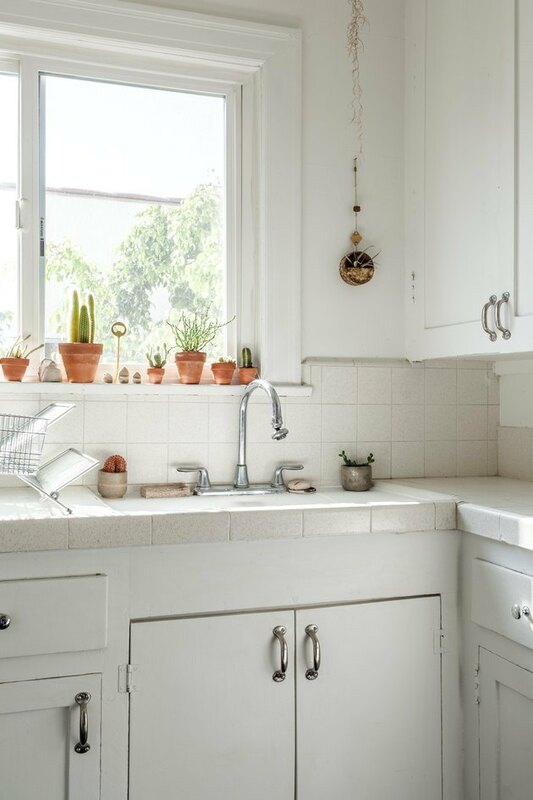 From one amazing rented space to another, this compact kitchen proves that you don't need to own a mansion to bring a carefree vibe to your home. 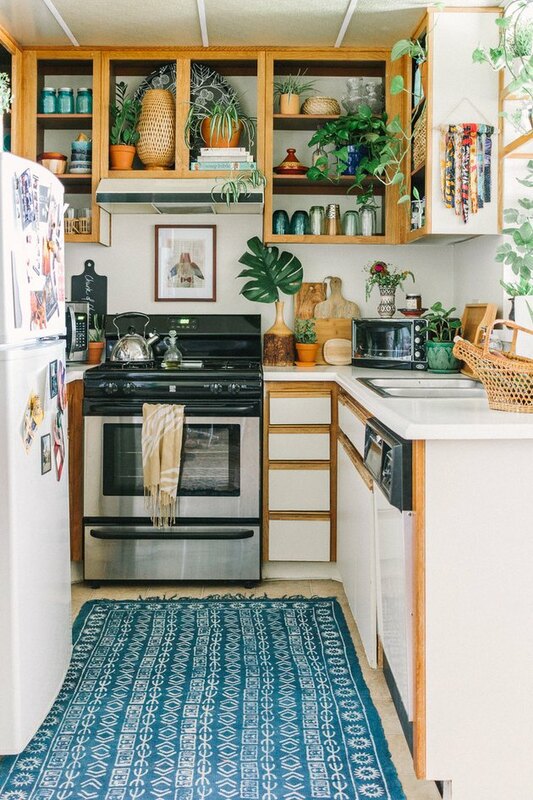 Blogger Sara Toufali from Black and Blooms revamped her cook space by adding plenty of plant life, artwork, and handmade objects. She also removed the upper cabinet doors to create open shelving — creativity at its best. And breathe. Bohemian interiors don't have to equal clutter, as perfectly demonstrated in L.A.-based photographer Katherine Rose's home. By keeping her kitchen surfaces clear, and choosing only to display a select number of boho-chic accessories, she has room to create picture-perfect dishes in a bright and airy cook space. A marble breakfast bar reserved for coffee and tea? Yes, please. Greenery plus rattan bar stools and pendant lights add boho flair in this charming seaside kitchen, coordinating perfectly with the dreamy blue hue of the walls and area rug. If there's wall space in your kitchen, utilize it. Macrame artist Emily Katz lined her walls from ceiling to countertop with floating wood shelves to display all of her wares. The warmth of the wood is complemented by contrasting black lower cabinets and a patterned area rug to bring about a sense of drama. If you weren't thinking about neutral colors, textures, and finishes for your own bohemian kitchen, you probably are now. 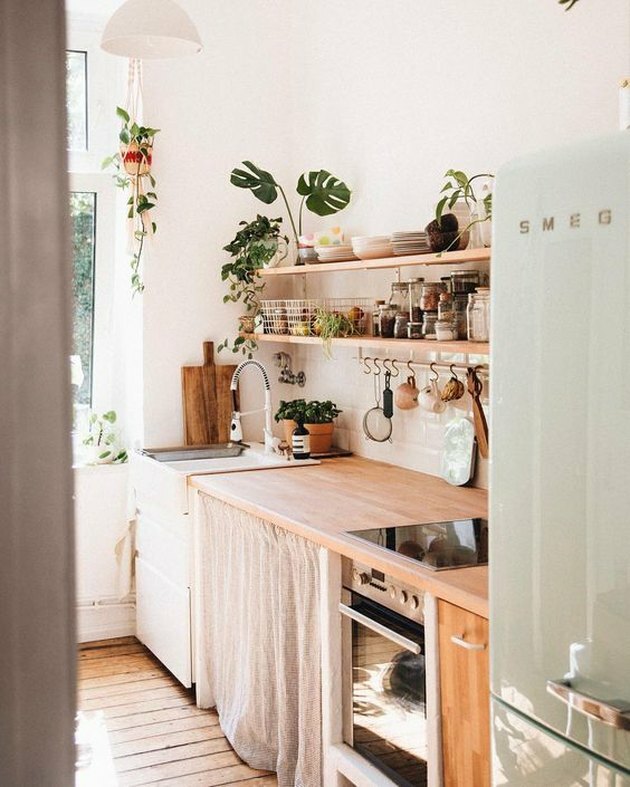 This inviting space features all of that and more, including warm wood shelving and countertops, impeccably curated dishware, lush greenery, and a pastel-hued refrigerator to complete the look. And the natural light pouring in through the window doesn't hurt either. Dreamy!